Over at Julie's: Good Ham Deserves a Great Rye! Will and I have both been craving our special ham . . . an incredible ham at a reasonable price . . . Kentucky Legend Ham. There is no store brand that can hold a candle to this ham! The meat is lean, perfectly seasoned and smoked. Because the meat is drier than most hams, it will last in the fridge for up to a month. Of course, a ham sandwich is only as good as the bread it sits on . . . When we have ham in the house, I just have to make rye bread! I'm always on the lookout for new bread recipes, but especially great rye breads! This Scandinavian Rye Bread is my adaptation of a recipe from ~ THE BEST BREAD MACHINE COOKBOOK EVER, author ~ Madge Rosenberg. Most rye bread recipes call for a half cup of rye, and a tablespooon of caraway seeds, and molasses. Scandinavian Rye is in a class all by itself! It's a dense, rich, bread, made with liberal amounts of rye, caraway seeds, unsulfered molasses, and dark beer, offering a bold robust taste. Slice it thinly for Danish open-faced sandwiches (smorrebrod, pronounced "smurebrid", which literally means ~ butter and bread). Top with a sliver of smoked salmon, shrimp and hard boiled egg slices, or sharp cheese. Slice thicker, and you have the perfect pallet for an over-the-top ham sandwich. Don't forget the DIY ~ Spicy Honey Mustard! Add all the ingredients in the order above, minus the yeast. Make a shallow well in the center of your flours, making sure you don't break through to the liquids, and add the active dry yeast. Set bread machine on DOUGH CYCLE (1:30). When bread machine is finished, shape dough into an oval loaf, on a lightly floured surface. Cover with greased plastic wrap or a tea towel, and let rise in a warm, draft free spot for 60 minutes; then preheat oven for 10 minutes to 350F/177C. Brush bread with egg wash; slash with a sharp knife about 1/4-inch deep. Bake for 25 minutes, or until bread sounds hollow when tapped. Well, there you have it . . . Yet another rye bread! 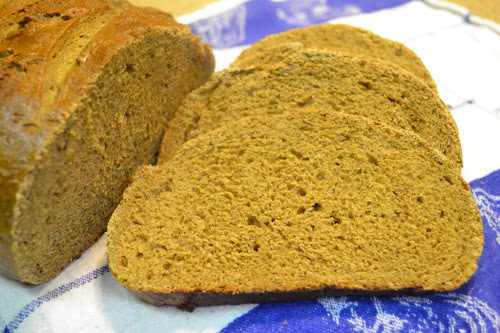 Can one have too many rye/pumpernickle bread recipes? I think not! I always feel so spoiled when I eat rye bread, because it's so darn expensive to buy! 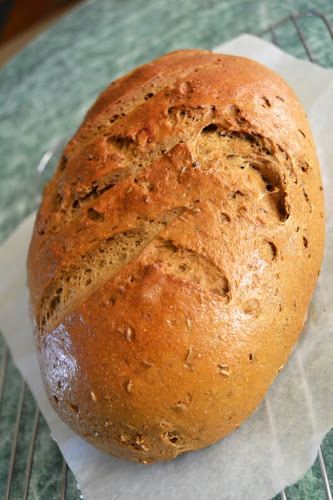 Making your own rye bread will save money, and give you peace of mind, by knowing exactly what went in to making your bread . . . But the quality and flavor of homemade rye bread is far superior to any you can buy! 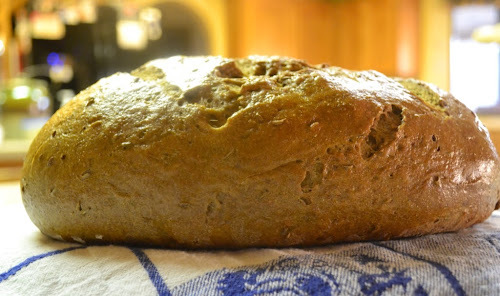 If you are new to rye bread, start off with my recipe for Potato Rye. It has a milder flavor and softer texture . . . Perfect for beginners! Enjoying the strong flavors in rye is an aquired taste, but once you've acquire the taste . . . Katie bar the door! You'll be hooked! I learned to love rye as a little kid of 4 or 5. My Gram would butter my bread with butter and crunchy peanut butter! I still love rye bread that way! This weekend Will is replacing the 20 horse engine on our lawn tractor (that threw a rod) with a 27 horse Pro engine. I've gotta say, "I'm so proud of him for taking on such a huge project, especially with the heat index sitting at 108F/42.2C today! Hope you all have a great weekend! From - All of us . . . Over at Julie's!!! P.S. ~ Today is Libby's 17th Birthday!